Dave says, "Leadership is influence. If you have influence over anyone, you are a leader. If you are a parent, employee, employer, brother, sister, or are otherwise breathing in and out, chances are that you have influence. In that case, you should read this book which is one of the most important books on leadership that’s ever been written. It's important for any leader in any walk of life to read and apply." 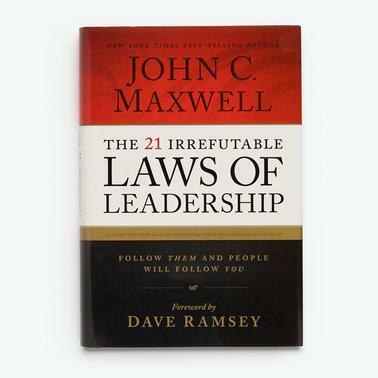 John C. Maxwell has combined insights learned from his 30+ years of leadership successes and mistakes with observations from the worlds of business, politics, sports, religion, and military conflict. The result is a revealing study of leadership delivered as only a communicator like Maxwell can. Henry Ford nearly sent his own company into bankruptcy. Some entrepreneurs receive plenty of money from venture capitalists while others can't get a dime. Princess Diana was loved by millions while her husband couldn't persuade people to give him the time of day. Coca-Cola's stock held strong even when its CEO suddenly died. An unknown pastor in a developing country grew the size of his church from 700 to 14,000 people in seven years. The Law of the Lid is the most important leadership principle you will ever learn.